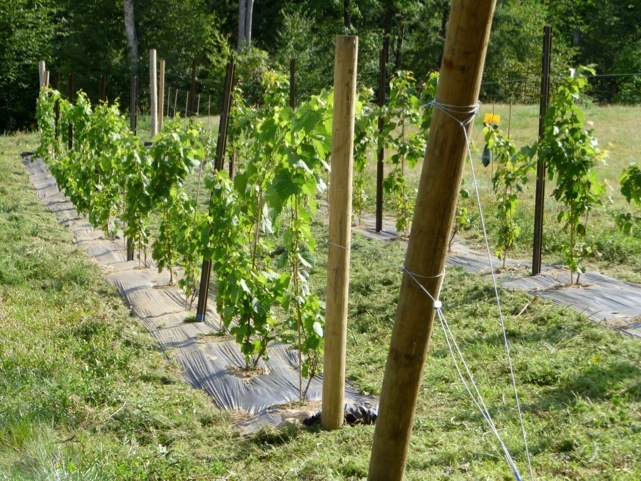 August 14 - Our vines are all doing very well. The growth tubes came off in early July, a month earlier than planned because we had strong growth on both test beds and most vines. Despite some burning when the tubes came off, and some sulfur & copper damage to the La Crescent's, everything has progressed beautifully. And we got a recent thumbs up after a visit from our friendly Plant Pathologist and IPM specialist at the University of Vermont, so all's good! We've had a dry summer with hot days and cool nights. That's kept mildew issues to a minimum. There are no symptoms of anthracnose, phomopsis, black rot or downy mildew. Our main predator has been the Japanese Beetle, a common visitor to young vines, but they're under control using standard traps. 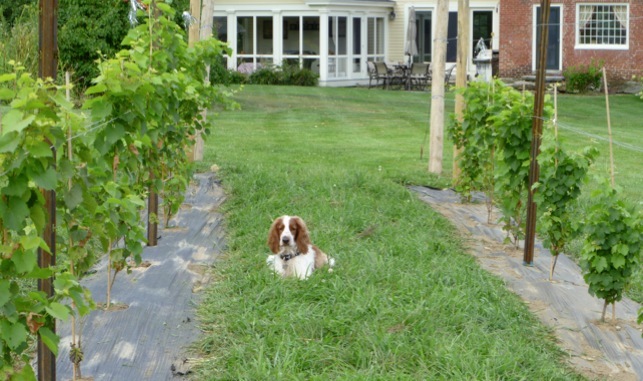 Ziggy's at home in the vines and is our best protection against birds - a job he undertakes relentlessly. Vines in the main field and back fields are both doing well, with slightly more vigorous growth overall in the back plot. There is more sun in the back field and a slightly higher sand content in the soil. The back plot is recently forested land compared to the main field which has been hayed or lawn for many years. The most significant difference between the two plots is in the La Crescents - they are more healthy in the rear field. We even had some time to build drainage between two of the fields. Here's the site of a new bridge project for the fall.